Of all the wretched little nasties that can be found bogarting space in a border or bed, Bindweed has got to be one of the least welcome. This is not just because it is a weed, nor because it is a particularly resilient weed, but because it is a fast spreading resilient weed that quite literally strangles other plants. Like many of the more persistent weeds, a single Bindweed plant is effectively a giant web of deep growing roots that are extremely brittle and will break easily if pulled up, leaving pieces that will grow back into a full plant. It also has no central plant or bulb that can be dug out, every little piece of the plant being capable of growing into a plant. But wait it gets worse. The really impressive thing about Bindweed is not that it can survive almost any attempt by a gardener to get rid of it, but the way in which it spreads. The way it does this is first via rhizomes, tiny stems that spread through the top layer of soil in vast numbers to wherever they can find conditions suitable for the plant. After it has spread to an area it will then produce fast growing shoots that will spread across the ground. Now obviously the primary purpose of these shoots would be to catch the sun and pollinate, just like any plant, or so you might think. Bindweed gets its name from the way in which it tangles itself around any and all other plants it can get to, effectively smothering them. 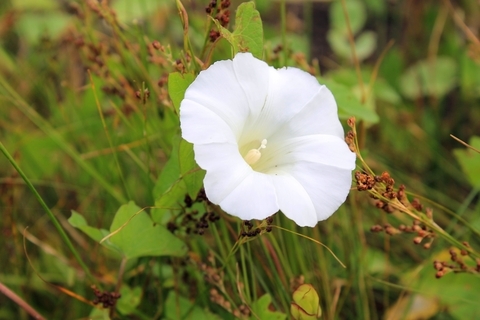 It is this rampant aggression that makes Bindweed such a nightmare, since it isn’t just unsightly, it’s vicious and can cause serious damage to your plants if you let it. Now, this may seem like a fairly doom and gloom prognosis, especially if you have bindweed in your garden but there are things you can do. Firstly, this time of year is the best time to find and begin getting rid of it. This is because Bindweed flowers at this time of year. Not unattractive in its own way (see below), Bindweed produces trumpet shaped flowers that can be either white or pink depending on which of the two varieties of Bindweed you have; Hedge Bindweed (Pink) or Field Bindweed (White). This makes it easy to see the full extent of the Bindweed and start planning your attack. As I said before, Bindweed likes to tangle itself around other plants, so if you just start tearing at the masses of tangles you may end up damaging plants you actually want. The tedious part of the process is this detangling, you have to try and unravel the Bindweed from around the other plants in the bed and resist the urge to just cut them free as this may result in bits of Bindweed escaping and propagating into new plants. Once the Bindweed has been untangled you can begin removing it. This bit can also be quite tricky, as Bindweed is a master of leaving bits behind. Really the only way to be rid of it is to dig it out, removing the stems and roots at the same time. However, this is a problem as the tangles of stems on the surface will make it difficult to properly get at the base of the plant to dig it out without ending up scattering little bits of Bindweed everywhere. This organic method of removal will take a great deal of persistence to pull off. Almost certainly you won’t get it all out in one and so will need to be vigilant against any new shoots trying to re-establish themselves. These you can either hoe on the surface to weaken the plant over time or go the whole hog and dig the bed again as soon as you see them. In the end I have to say the most efficient way of bumping off Bindweed is good old chemical warfare. A glyphosate spray or gel applied to the foliage will be taken in immediately by the Bindweed and is a much more reliable way of getting the whole plant. Of course you have to be careful, glyphosate is powerful and really the only effective weed killer for blitzing Bindweed. It is however non-selective, which means it will make your desirable plants just as dead as the Bindweed if you get it on them. Make sure to apply the glyphosate carefully and preferably do so after you have disentangled it from the plants you want to keep. Interestingly it’s worth noting that the best time to spray the bindweed is early evening when it is more receptive. 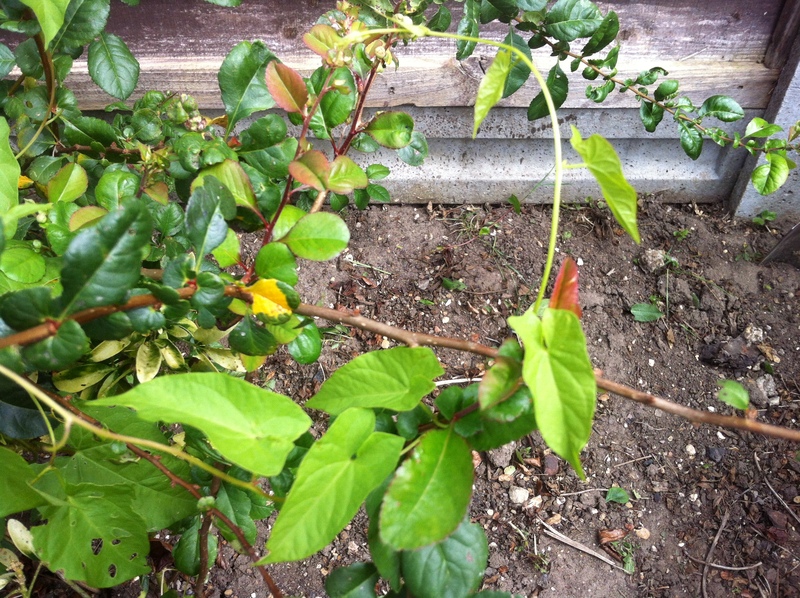 Once sprayed, the weed killer will kill off a good portion of the plant, which can then be pulled out at leisure without worrying about bits growing back. You may need to repeat the process a few times over the summer but this will keep it away longer. Of course many of you will not want to use chemicals however effective they may be and so will want to go for the organic option, but either way there is one more trick that both approaches will benefit from. As most keen gardeners will know, planning ahead is crucial to the success of a garden and tackling Bindweed is no exception. So, once you’ve tackled the Bindweed in your garden this time, either by spraying or digging, put some bamboo canes in a rough circle around the formerly afflicted area. This will act as a nefarious trap for any future Bindweed that may propagate in the area, as it will immediately try to climb around the first plants it finds, trying to smother them. Only the first plants it finds will not be plants, they’ll be bamboo canes. The Bindweed will put all its energy into trying to smother these big, tall, woody plants it’s found and in so doing make itself a perfect target for disentangling and spraying or hoeing. Either way it will make it so much easier.